Sponge cake with 3 layers - strawberry fresh cream and fresh fruits. 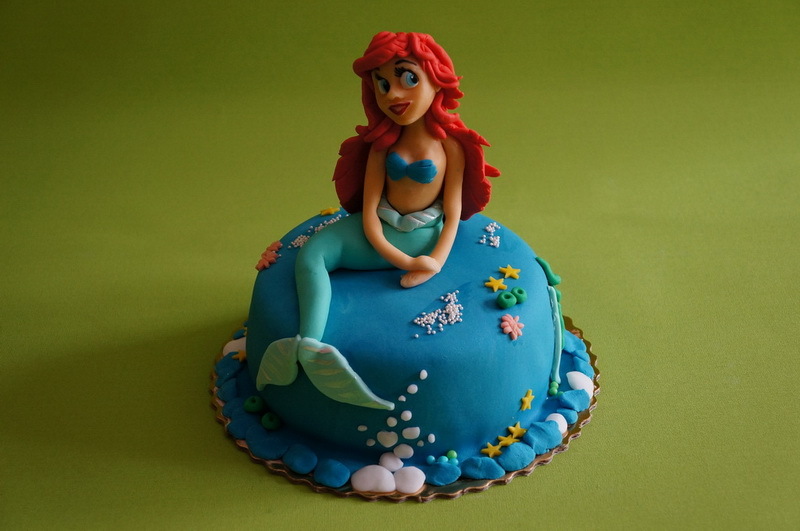 The Little Mermaid lives in an underwater kingdom with her father, the sea king; her grandmother and her five elder sisters, each born one year apart. When a mermaid turns 15, she is allowed to swim to the surface to watch the world above, and as the sisters become old enough, one of them visits the surface every year. As each of them returns, the Little Mermaid listens longingly to their various descriptions of the surface and of human beings. When the Little Mermaid's turn comes, she ventures to the surface, sees a ship with a handsome prince, and falls in love with him from a distance. A great storm hits and the Little Mermaid saves the prince from nearly drowning. She delivers him unconscious to the shore near a temple. Here she waits until a young girl from the temple finds him. The prince never sees the Little Mermaid. The Little Mermaid asks her grandmother whether humans can live forever if they do not drown. The grandmother explains that humans have a much shorter lifespan than merfolks' 300 years, but that when mermaids die they turn to sea foam and cease to exist, while humans have an eternal soul that lives on in Heaven. The Little Mermaid, longing for the prince and an eternal soul, eventually visits the Sea Witch, who sells her a potion that gives her legs in exchange for her tongue (as the Little Mermaid has the most intoxicating voice in the world). The Sea Witch warns, however, that once she becomes a human, she will never be able to return to the sea. Drinking the potion will make her feel as if a sword is being passed through her, yet when she recovers she will have two beautiful legs, and will be able to dance like no human has ever danced before. However, it will constantly feel like she is walking on sharp swords hard enough to make her bleed. In addition, she will only get a soul if she finds true love's kiss and if the prince loves her and marries her, for then a part of his soul will flow into her. Otherwise, at dawn on the first day after he marries another woman, the Little Mermaid will die brokenhearted and disintegrate into sea foam. The Little Mermaid drinks the potion and meets the prince, who is attracted to her beauty and grace even though she is mute. Most of all he likes to see her dance and she dances for him despite her excruciating pain. When the prince's father orders his son to marry the neighboring king's daughter, the prince tells the Little Mermaid he will not because he does not love the princess. He goes on to say he can only love the young woman from the temple, who he believes rescued him. It turns out that the princess is the temple girl, who had been sent to the temple to be educated. The prince loves her and the wedding is announced. The prince and princess marry, and the Little Mermaid's heart breaks. She thinks of all that she has given up and of all the pain she has suffered. She despairs, thinking of the death that awaits her, but before dawn, her sisters bring her a knife that the Sea Witch has given them in exchange for their long hair. If the Little Mermaid slays the prince with the knife and lets his blood drip on her feet, she will become a mermaid again, all her suffering will end and she will live out her full life. The Little Mermaid cannot bring herself to kill the sleeping prince lying with his bride and as dawn breaks she throws herself into the sea. Her body dissolves into foam, but instead of ceasing to exist, she feels the warmth of the sun; she has turned into a spirit, a daughter of the air. The other daughters of the air tell her she has become like them because she strove with all her heart to gain an eternal soul. She will earn her own soul by doing good deeds for 300 years; for each good child she finds, one year would be taken from her sentence while for each bad child, she would cry and each tear would mean one day more and she will eventually rise up into the kingdom of God.